Patients come to us because we are friendly and our gentle demeanor puts them at ease. See for yourself and be pleasantly surprised. Call today to learn how we can exceed your expectations in dental care. Emergency appointments welcome! Reach a doctor by phone 24 hours a day. 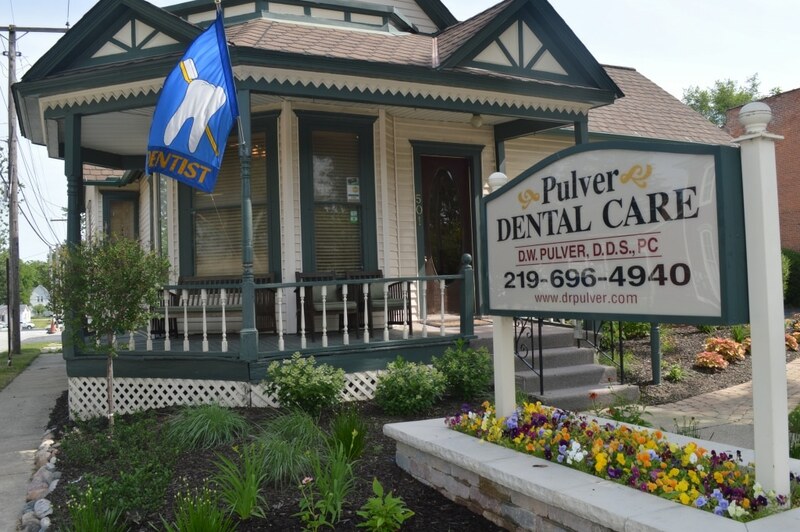 Here at Pulver Dental Care, we pride ourselves on providing top quality family and cosmetic dentistry. We are located in Lowell, IN, and have compassionately served our patients for over 35 years. Our mission is to realize a shared vision of uncompromising excellence in dentistry. We listen to our customers and strive to earn their trust and respect at every visit. We are proud to offer dental services for children and adults. We want to exceed all of your expectations and foster a creative, compassionate, and professional environment. As a practice, we are always working to continuously improve ourselves on all levels. We appreciate and always welcome feedback from our patients. Communication with the patient is key. Let patients have a say in their oral health care plan. Professional yet down to earth. Getting dental cleanings are incredibly important to maintain your oral hygiene. Dental techniques that enhance the appearance of one’s teeth. When you have missing teeth, dental implants may be an option you’d like to explore. Scaling and planing is the first step in periodontal therapy to treat and prevent the spread of gum disease. Do you have a dental emergency? Reach a doctor by phone 24 hours a day. Dental photography is a crucial part of providing the best care and treatment for our patients. Using high-tech cameras enables our practitioners to take both profile as well as full-face pictures, in addition to covering all angles and areas within the mouth. These photographic images will help us properly assess and treat any of your dental needs. Dental photography is comprised of two types: intraoral and extraoral. Both are used regularly to treat our patients. Both extraoral and intraoral photography play a crucial role in providing the best treatment and service possible for our patients. Digital imaging enables our team to scan and share images with you, walking you through any diagnosis and discussing potential treatment options with you in real time. Digital radiography is a major part of quality dental care. Digital X-rays give our team access to images that are sharp and vivid, which enhance the accuracy of any diagnosis. They also allow us to share these images with our patients to help you understand any proposed treatment plan. Extraoral and Intraoral Digital Imaging - Extraoral radiography takes images from the outside of the mouth and is used to detect issues with the face, skull, and jaw. Intraoral digital imaging involves the insertion of sensors inside the mouth. There are many different types of intraoral radiographs, each of which show a different aspect of the teeth and can help to determine the proper diagnosis. us to make the best decisions regarding treatment approaches while relaying the visual information to the patient in a comprehensive manner. Using an intraoral imaging system, your dentist will incorporate a technique known as 'paralleling'. This method involves placing an X-ray film parallel to a tooth or teeth and using the intraoral sensor to scan perpendicularly. Films can be placed at a variety of angles and in a multitude of locations, each time re-angling the sensor in order to achieve the highest quality image. This can be done quickly, producing images nearly instantaneously. Intraoral imaging systems are used to aid a variety of diagnostics including assessing inflammation of the gums, producing dental views of the bitewing, occlusal, full mouth, and periapical, as well as determining an endodontic file location. This system is not only used by dentists, but also orthodontists, periodontists, prosthodontics, and oral surgeons. When we can be faster, more efficient, and provide a visual aid to our patients, both parties benefit. High-quality imaging systems guarantee contrast and spatial resolution of images, which allows us to maintain our high standards of excellent customer service and care. Hopefully, you take pride in your beautiful, healthy smile and plan to take care of it as best as you can. Along with a good at-home oral care routine and regular dental visits, what you eat and drink can greatly affect your teeth. While you may be aware of the dangers of candy and other sugary snacks, there are also many other food groups you should be wary of as well. One danger for your teeth in different foods, even healthy ones, is acidity levels. Very acidic foods and drinks can damage your tooth enamel and/or stain your teeth. While these foods are fine in moderation, just keep in mind that you don’t want to over-do it and risk hurting your smile. Sugary or sticky foods, as stated previously can also harm your teeth, as they are harder to clean off of your teeth and can cause plaque build-up. Avoid them as much as you can, or be sure to thoroughly brush and floss your teeth after eating. One of the worst and also most common bad dental habits that people often do is chewing on ice. Ice can greatly damage and easily chip your teeth. Chewing ice can also wreak havoc on your enamel and existing cavities and fillings. It can cause problems with your jaw and lead to tooth sensitivity as well. Pulver Dental Care encourages our patients to maintain a varied diet with plenty of fruits and veggies and keep the health of their teeth in mind when choosing what to eat and drink. Maintaining a healthy smile comes from years of good habits, including what you eat! Nothing really captures a child’s attention like their favorite cartoon. Looking for shows or movies that illustrate good oral hygiene practices and that paint the dentist in a positive light will encourage your kids to take care of their teeth. Make brushing fun by permitting your children to pick their own toothbrushes. A toothbrush with his or her favorite Disney princess or superhero will make brushing fun! Make sure to stick to softer bristled brushes for children’s teeth and to replace them every few months. Brushing teeth in the morning and before bed time doesn’t have to be a chore, it can be fun! Get creative, make a song that you sing with your child before they brush. By creating these fun rituals together, you will make oral hygiene an enjoyable and memorable part of your child’s day. Or, you can let your kids play their favorite song while they brush so they can dance and brush along to the music. There are even apps you can get that play two-minute versions of popular songs to keep your kids looking forward to brushing their teeth. Bring your child along to your dental visits so that he or she can get comfortable with the process of having your teeth cleaned and x-rays taken. You can show them that it’s not scary and can even be fun! By showing the positive aspects of dental visits, you will demonstrate to your child that the dentist office is safe and happy place. For additional dental tips for your children, contact Pulver Dental Care in Lowell, IN at (219)-228-1293! We love helping kids feel comfortable and excited about going to the dentist!